Simulation-based training systems comprise both simple, desktop PC-based trainers and complex systems incorporating multiple trainee stations. Simulation-based training, where the student works through a scenario on a computer, is used in a variety of areas including plants, ground transportation, aviation, combat and police personnel training, ship handling, and many others. To assess the student’s progress, it is important to monitor and record the training or video streams from the trainees’ displays. VGA Grid from Epiphan Systems provides simultaneous video capturing, streaming and recording of the simulation-based training sessions. Large plants often conduct training through control room simulations. Operators are trained using multiple practical scenarios that cover main process areas. Such simulators reflect the behavior of a real plant and are of great benefit to the operators. Control room simulator equipment includes many controls, gauges and displays – trainees must be very competent in using them correctly according to the appropriate scenarios. VGA Grid allows an instructor to simultaneously monitor their activity in different areas. This device is connected both to the VGA cameras and VGA, DVI or HDMI™ displays. It combines dozens of signals and relays them on a single display for the instructor. Furthermore, live video streams from cameras and displays can be recorded and time-stamped. VGA Grid is useful for monitoring and recording data from the different types of simulators: both a full-scope simulator replicating the control room and an analytical simulator. When used with the first type, VGA Grid records live video stream in the control room from multiple survey points. As for the second type, operators enter computer commands and video is recorded directly from the computer monitor screens. When control room operators are trained in responding to routine and emergency situations, it is possible to play back all trainees’ reaction times using VGA Grid and analyze the obtained results. Another area where simulation-based training systems are often used is air traffic control. Air traffic control simulator covers airport ground and air operations. Control room displays reflect movement of aircraft and vehicles. Operators are trained to respond to the associated ground and radar situation. As trainees practice in different virtual scenarios, they gain essential skills and get familiar with procedures and potential hazards similar to their live working environment. VGA Grid allows streaming and recording of the training no matter where the instructor is located. He/she fully monitors the trainee responses from a separate room during or after the training and gives competence assessment. As VGA Grid provides video broadcasting and recording with high resolution up to 2048×2048, all operations and instrument readings are distinctly visible. Due to its functionalities, VGA Grid improves the effectiveness of any simulation-based training system. 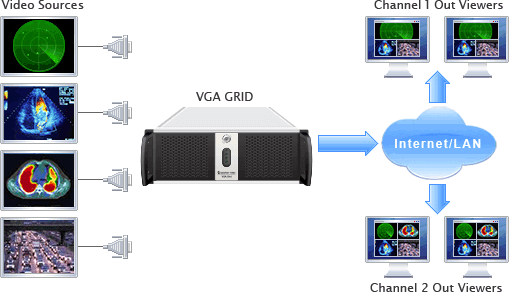 VGA Grid is a highly scalable video recording and streaming system which can either be deployed as a standalone system performing capture of directly connected video sources or as a networked solution supporting capture of remote sources using encoders connected over an Ethernet/IP network.